Protestors call for independence for southern Yemen, 2013. Facing popular protests, a secessionist movement in the south, a spiraling security crisis, and a deep fracturing of political factions, Yemen’s political elite acceded to the Gulf initiative in 2011, which established a caretaker transitional government. The agreement signed in Riyadh stipulated a two-year transitional period and created a National Dialogue Conference (NDC) as a forum to solve the country’s political problems. The results of the National Dialogue will form the basis for a new constitution, and Yemenis will then elect a new government to conclude the transitional period. The National Dialogue has concluded, but it is not clear whether it can really solve Yemen’s political problems. The two-year transitional period ended without a new constitution or elections—these will be held at some undetermined later date—and facts on the ground may be outpacing the deliberations of the political elite and their international backers. The government cannot prevent attacks on its oil pipelines or electrical grid; al-Qa`ida operates with almost impunity in the capital city Sana; the Houthi movement is expanding its area of control, recently taking the symbolically important towns of Huth in Amran and Dammaj in Sa`ada; and the south remains unsettled and far from accepting of any solutions proposed by the Sana elite. In February 2014 the committee created to “resolve” the issue of southern rebellion decided on a federal system of government composed of six regions. Yet most Yemenis do not know what federalism is, and what’s more, they don’t care. Deteriorating security and the rise of poverty have overwhelmed any interest most citizens might have in the details of the elite’s visions for the future of the country. Both Saudi Arabia and the United States, the most important foreign actors in Yemen and backers of the Gulf initiative, are focused on their own regional interests, sometimes to the detriment of Yemeni interests. The Saudis want to maintain their influence on the Yemeni government, fight Iranian influence, and control threats from Yemeni soil spilling over into Saudi Arabia. However, the Saudis recently expelled from the Kingdom hundreds of thousands of Yemeni workers, exacerbating Yemen’s desperate economic situation. The United States is focused on al-Qa`ida and Iran. The American drone campaign continues to wreak havoc, recently killing members of a wedding party in spite of President Obama’s new procedures to bring the targeted assassinations under the color of law, and the United States seems unable to relinquish its misperception that the Houthis in Sa`ada constitute a new Hezbollah. With such deep divisions in Yemen’s political body and in the competing regional agendas of Yemen’s foreign backers, Yemen’s prospects for a peaceful political settlement that will allow the country to stabilize and grow seem dim. As the National Dialogue Conference’s February 2014 deadline neared, Galaladdin bin Omar, the United Nation’s special envoy to Yemen, argued that the Gulf initiative that created the framework for the transitional government is a mission rather than a time period. He asserted that the mission would be completed when a new president is elected, not on a pre-stipulated date. Bin Omar’s semantic rephrasing of the legal framework of Yemen’s transitional period was a stark reversal from his earlier insistence that there would be no extension. Bin Omar and the international community, or “Group of Ten” countries supervising the period, feared that any delay would undermine the legitimacy of the government and unravel the fragile peace that the Gulf initiative had built. Now, however, it is evident that mending Yemen’s torn political fabric will take longer. As usual, bin Omar blamed former president Ali Abdullah Saleh and his supporters for undermining the transitional process, but this time he also leveled accusations against Mohammed Ali Ahmad and others from the Southern Separatist Movement who withdrew once again from the National Dialogue. Yet, while bin Omar may want to cast blame on these figures for delaying the transition, the real blame lies with inherent difficulties in the Gulf initiative framework. The Gulf initiative, signed by Saleh in 2011, superseded the Yemeni constitution and provided the legal foundation for Yemen’s current government. The agreement stipulated the two-year transition period after Saleh’s resignation run by a government composed of half opposition ministers and half ruling party ministers and headed by Abdu Rabbu Mansour Hadi, Saleh’s vice president. The difficulties in completing the transitional plan of the Gulf initiative stem in part from the nature of the initiative itself. The Gulf initiative was an agreement between the competing elite factions of the old Saleh regime that had split into warring sides during the “Arab Spring.” The street protests in Yemen were the final straw rather than the force that brought down the Saleh regime. As such, Yemen’s Arab Spring was more an internecine fight between regime elites than a popular revolt that deposed a dictator. Saleh’s attempt to guarantee his son’s succession to the presidency in the 2000s had alienated even the closest of Saleh’s allies, and after the massacre of 51 protestors on March 18, 2011, Ali Mohsin al-Ahmar and Sadiq al-Ahmar, two of Saleh’s closest associates, declared their opposition to him. Sana was divided into opposing military camps. At the end of May, a pitched battle broke out between forces loyal to Saleh and supporters of Sadiq al-Ahmar in Sana’s Hasaba district, the home of al-Ahmar. This split in the core of Saleh’s regime did not happen overnight, and it was not just the question of succession that broke the regime. The Saleh regime’s political failures in the 2000s had already caused serious frictions within the ruling elite. Hamid al-Ahmar, the most prominent of the nine brothers of Sadiq al-Ahmar, was already publicly calling for Saleh’s resignation in 2009. Saleh also failed to politically stabilize the south after the 1994 war or to contain the conflict in the north that caused the rise of the Houthi movement. New competing elites such as the southern Hirak—the Southern Separatist Movement—and the Houthis rose to lead these areas in rebellion against the Saleh regime. In the end, the divided Yemeni elite and their foreign supporters, particularly the United States and Saudi Arabia, negotiated the Gulf initiative, not the leaders of the street protests. As a result, the impetus of the initiative was to guarantee the interests of the Yemeni elite and the United States and Saudi Arabia, not implement the changes demanded by the protestors. Rather than allowing their quarrels to destroy the house they ruled, the elites, with their foreign backers, agreed to contain their conflicts and preserve their dominion over the Yemeni state. Both the United States and Saudi Arabia view Yemen primarily through the lens of security issues. The United States deems al-Qa`ida in Yemen its most prominent threat, and the Saudis see not only al-Qa`ida but also Yemen itself as a major source of trouble for the Kingdom. Political stability and economic growth are promoted, but mainly as measures to stabilize the country and enable it to control the threats that the United States and the Kingdom fear. After the March killing of protesters and the defections of Ali Mohsin and Sadiq al-Ahmar, the United States and Saudi Arabia appear to have decided that Saleh was an impediment rather than an aid to stability and counterterrorism efforts. Thus the two governments began searching for a way to repair the damage of internecine fighting. They hatched the Gulf initiative during the late spring of 2011 and began pressuring Yemeni elites to negotiate. The heavy fighting in Sana in late May and a bomb attack on the president’s mosque in early June seem to have jolted the Yemeni elite into the realization that their fighting might be threatening their own position. During Saleh’s medical recovery in Saudi Arabia from the bomb attack, the U.S. government tried to create a de facto government under the vice president and without Saleh. Saleh’s family, however, managed to scuttle those attempts and preserve the Saleh presidency until his return to Yemen in September. Two months followed in which Saleh avoided signing the Gulf initiative, but he finally relented on November 27, 2011. Though the Gulf initiative was an elite pact, some of demands of the street protestors featured the ideals of liberal democracy and human rights espoused by the United States, the UN, and European governments—and were thus strongly represented in the National Dialogue. Indeed, the language of political reform and rational human progress dominates the National Dialogue’s final document, and as a result some of the protestors’ demands are reflected in it. For example, a secondary document created as a roadmap for guaranteeing the implementation of the NDC’s document stipulates that 30 percent of parliament must be reserved for women. 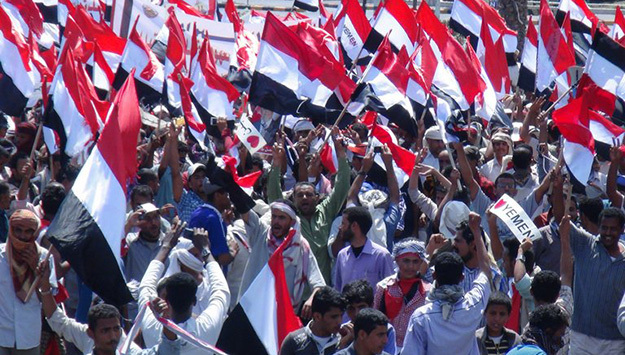 Those who took to the streets in protest against Saleh’s regime in 2011 wanted fundamental change. The protestors came from a wide range of political perspectives, but dominant among their demands was the call for deep reform in the state in order to better represent the aspirations of the large majority of young Yemenis who do not see their dreams for the future realized in the current state of affairs. The protestors demanded what is being translated as a “civil state,” a state ruled according to law in which technical competence and effective bureaucracy keeps political corruption to a minimum. The protestors attacked what they saw as the ills of Yemeni society: entrenched elites that rule by patronage and violence. These demands coincided with much of the rhetoric of international development agencies and the IMF for good governance. The National Dialogue convened with 565 delegates. Their composition reflected the desire to overcome the southern issue and to present a progressive face of change. Fifty percent of the delegates were of southern origin, 20 percent were “youths” (that is, under 40 years of age), and 30 percent were women. Being of southern origin does not translate into support for the southern cause, much like being a woman does not translate into support for UN-style rights for women; however, the inclusion of these quotas clearly signaled the dominance of liberal ideals for the future character of the Yemeni state and society. The Dialogue distributed its work among subcommittees that addressed the central controversies: the southern issue, the Sa`ada conflict, transitional justice, state building, good governance, the military and security apparatus, institutional independence, rights and freedoms, and development. Some of the committees completed their work without much controversy, indicating general agreement on the issue at hand. The freedom and rights subcommittee compiled a long list of suggested rights that reads more like a list of everything desirable in life than a legal definition of rights. Yemenis should have the right to a job, clean water, education, sufficient income, and food, and freedom from violence, coercion, and intimidation. The final report also declares that the minimum age of marriage should be 18 for both men and women and that female genital mutilation should be prohibited. The military subcommittee also completed its work easily. All agreed that the military should be professionalized and depoliticized and that only the state should form armed groups. How to achieve this goal is another matter entirely. Surprisingly, the report on the Sa`ada conflict, in which the Houthi movement controls the entire governorate of Sa`ada and parts of the surrounding governorates of al-Jawf, Amran, and Hajjah, was uncontroversial. The Houthi movement was born of attempts to defend and revive the Zaydi tradition in the face of the spread of alternative Muslim practices such as Wahhabism from Saudi Arabia, as well as Salafism, but the heart of the Houthi movement is now a rejection of the abuses of the regime in Sana. The six armed conflicts between the Houthis and the government tore apart the social fabric of the north and created waves of displaced people. The subcommittee on the conflict called for freedom of thought and worship for all sects, good governance and economic development, a prohibition against receiving foreign support, the prevention of the military from being used in internal political struggles, and the disarming of militias. The Houthi movement is a well-armed militia with ties to Iran, so it is ironic that it would allow a report calling to cut foreign ties and disarm, but the Houthis are in full control of the north and have defeated the Yemeni military in the six wars, so they have little to fear from the Yemeni government. The movement will be able to determine how and when its territory is reintegrated into the Yemeni state. And the Houthis see the call to prohibit foreign intervention and militias as directed against their enemies: the Salafis, who the Houthis finally managed to force out of Dammaj in January 2014 after decades of conflict; the leadership of the Hashid tribal confederation, whose territory in Amran is under intense military pressure from the Houthis; and Saudi Arabia, who supports both the Salafis and Hashid. The call to end foreign intervention also bolsters the Houthis’ call for the United States to leave Yemen. The fact that the Sa`ada report was so easy to agree upon reflects the Houthis’ political and military confidence and the fact that, in principle, Yemenis agree on general principles of national sovereignty and virtuous governance. The most contentious issues have been the southern issue and the related question of the structure of the future state, addressed in the state building subcommittee, but the southern issue is not the only issue refusing resolution. The subcommittee on transitional justice could not submit a final report because of objections from Saleh supporters. The Gulf initiative gave Saleh immunity from prosecution, but some members of the transitional justice committee and many Yemenis wanted to prosecute those responsible for the killing of unarmed protestors. At a minimum, many thought that the members of the former regime and their relatives should not be able to play a political role in the future, and the Gulf initiative is silent on this issue. Saleh has been able to retain his role in Yemeni politics through his leadership of the General People’s Congress and the many prominent Yemenis who remain loyal to him. Supporters of the president have been able to stall the work of the transitional justice committee and prevent it from suggesting prosecution of those in the former regime responsible for violence against protestors, confiscation of land or other assets, and misallocation of public funds to private pockets. The feisty minister of law, Mohammed al-Mikhlafi, has repeatedly raised the issue of “stolen” state assets, though his efforts as of yet have not had real effect. The idea that the warring elite and the new elites from the periphery that have taken control of large swaths of Yemen’s territory in the north and south could sit down and work out the new rules for governing Yemen in a new constitution may seem a bit farfetched. Indeed, when the issue of the Southern Separatist Movement’s representation in the National Dialogue arose, many southern factions rejected any participation. Southern society seemed disinclined to trust a settlement arranged by Sana’s elite. Yet for the northern elite and the international overseers of the Gulf initiative, southern secession was not an option. Seeing the call for secession as destabilizing, the UN, the United States, and Saudi Arabia rejected calls for a separate southern state and insisted that the National Dialogue was the only means to resolve the southern issue. As a result, the representation of the southerners became the most problematic issue to arise in the preparation for the Dialogue. No clear voice emerged to speak for the south. When it seemed that the issue of southern representation would derail the Dialogue before it even began, Hadi resolved the issue by appointing members of his faction in the south. While this solved the immediate problem of southern representation, it set the stage for even more serious issues because the southern representatives lacked the legitimacy needed to deal for the south. The selection of the southern representatives was only the beginning of the controversies. Outside of the subcommittee looking directly at the southern issue, the subcommittee investigating the structure of the state became the arena of disputes related to the southern issue. The southerners from the Hirak participating in the National Dialogue insisted that the state be a federal one composed of two states formed from the territories of the former Yemen Arab Republic in the north and the People’s Democratic Republic of Yemen in the south. The former territory of the PDRY would be divided into two areas, one composed of the western portions of the south and the other made up of the eastern portions. The Hadrami elite in the east liked this solution because it gave Hadramis some independence from the mostly former socialist constituencies of the western portions of the south. The Hadrami business elite and tribal leaders suffered greatly under socialist rule and are disinclined to allow people associated with the socialist regime in Aden back into power. Northerners, the Group of Ten, and some southerners outside of the Hirak rejected the return of the two states. They proposed an alternative of five or six states that would prevent the former south from reconstituting itself. Hadi’s committee appointed to resolve the issue decided upon the six-region solution. Demonstrations in the south renouncing the Dialogue and calling for secession drew large crowds. The UN and the Group of Ten tried hard to build support in the south for the Dialogue. For instance, a committee was formed to address the pensions and employment of those in the southern bureaucracy and military who were dismissed after the 1994 war, and another committee was charged with resolving the issue of land and property in the south. In addition, Hadi announced the creation of a trust to fund efforts to resolve issues and compensate those hurt in the south during the last two decades of Saleh’s rule. Qatar donated $350 million to the fund. As the stubbornness of the southern issues stalled negotiations, a special high-level committee within the National Dialogue was created to negotiate the issues of the south outside of the framework of the southern issue subcommittee. This special committee was called the committee of sixteen because it was composed of eight representatives from the south and eight from the north. The south has been unimpressed by these measures. When the Security Council looked into bin Omar’s latest report at the end of November 2013, demonstrations outside the UN in New York and in Aden continued to demand that the UN recognize the right of the south to self-determination. As before, the UN and the Group of Ten’s response to the southerners has been to reject calls for secession and to insist in no uncertain terms that resolution of the Yemeni crisis will be in the context of a single, united Yemen. The UN and the Group of Ten have tried ostracizing those that call for secession by linking them to Iranian aspirations in Yemen or by painting them as self-interested individuals who would sacrifice the country for personal political gain. These accusations have mostly been leveled at Ali Salem al-Beidh, the former president of the PDRY before 1990, but in the latest UN report, bin Omar accuses Mohammed Ali Ahmad, the most prominent southern leader participating, on and off, in the National Dialogue and a close associate of Hadi, of delaying the process. Accusing Ali Ahmad of delaying the Dialogue is tantamount to labeling the Dialogue’s efforts on the southern issue a failure, as Ali Ahmad is among the few in the Southern Separatist Movement that was willing to participate in the Dialogue. The difficulty of the National Dialogue in resolving the southern issue and setting the stage for a constitutional convention and new elections is exacerbating pressing problems in the economy. Yemen is a poor country with a per capita income of about $1,000. The World Bank estimated poverty in Yemen at 42 percent in 2009 and 55 percent in 2012. Over the last two decades Yemen’s economy has been driven primarily by revenues from oil exports funneled through the state, and state employment and investment have played a prominent role in the economy. Now, Yemen’s oil is running out. Yemen’s future economy will be more diversified, but it will be forced to rely upon harnessing the domestic labor force for development. Yet Yemenis are not optimistic about their future and are hesitant to invest in the fruits of their labor in the domestic economy. They do not feel secure, and political insecurity has exacerbated the situation since 2011. Since the Arab Spring, the state in Yemen has, in essence, ceased to function. The transitional government is a caretaker government responsible to no one. Backroom negotiations in Riyadh and Sana created the transitional government, and its composition is a compromise between warring factions in Yemen who continue to battle. Government institutions serve not as institutions of government but fields of play in the fierce competition taking place between political factions trying to position themselves for whatever form of government arises in the future. The primary competition is between Saleh’s General People’s Conference and the Islah Party, Yemen’s most prominent Islamist party, which was historically close to the Saleh regime but broke decisively from it in 2011. Both Islah and the GPC prefer a shorter extension of the transitional period because they are best positioned to do well in an election, though it seems unlikely at this point that either could command an absolute electoral majority in parliament. The United States, the UN, and Saudi Arabia tend to agree that elections should take place sooner rather than later because of their faith in the legitimacy of the ballot box. Smaller parties and the youth movement would like a longer transitional period in order to establish a minimum of functional government that could establish an atmosphere in which legitimate elections could take place. The latter groups have less faith in the role of elections in good governance and see much deeper institutional change as a requirement for democracy. In the meantime the security situation in Yemen has continued to deteriorate. Yemen’s oil and gas is located in the eastern governorates, where gas-fired power plants supply Yemen’s electric grid. Electrical transmission lines run from the east to the western highlands where the majority of Yemen’s population resides. Between the gas-fired power plants in the east and the western mountains is a vast desert that the government seems unable to tame. Renegade tribesmen in the east have attacked the power transmission lines with impunity, to the point that the government conferred with a French firm to develop mobile towers to quickly replace the lines when they are destroyed. The oil pipelines from the east to the coastal ports are also regularly attacked and disabled. The motivations of the attackers are unclear. While the immediate motivation for the attacks appear to be payments from the government in exchange for guaranteeing security, the ongoing and continual nature of the attacks and the impotence of the government in the face of them raise further questions. Some argue that the government has lost favor among tribal leaders because it is unable to pay the tribal subsidies that it paid in the past. Others point the finger at Saleh, who they say has an interest in undermining the transitional government. The UN’s special envoy, bin Omar, has argued as much. Al-Qa`ida is also interested in undermining the transitional process due to the fact that the United States and Saudi Arabia are its principal enemies, at least publicly. During the tense summer of 2011 when Yemen’s military split into two warring camps around the capital city, security forces redeployed from outlying rural areas to the capital for the final battle. Al-Qa`ida took advantage of the withdrawal of these forces to initiate an insurgency in the southern part of Yemen that succeeded in taking over Abyan Governorate and some areas of Shabwa Governorate to the east. For a year Yemeni towns in these areas were ruled by the al-Qa`ida movement called Ansar al-Shariah. After Hadi was installed in the new transitional government in early 2012, he put together a network of supporters consisting of members of the military and local leaders to quickly overrun al-Qa`ida’s ground insurgency. As Hadi hails from Abyan, he was able to use his relations there to turn the tide against al-Qa`ida. Al-Qa`ida abandoned its attempt at governing and returned to its hit and run tactics. Since the summer of 2012, al-Qa`ida has launched a sustained campaign of assassinations against Yemeni security and military officers, killing high ranking officials with impunity. Al-Qa`ida appears to control significant areas of Hadramawt Governorate, where the assassinations are concentrated. Al-Qa`ida has also launched a series of bold raids against military bases, the latest against a central facility of the Ministry of Defense in downtown Sana. These attacks, al-Qa`ida claims, are aimed at disrupting the drone command centers in Yemen. Assassinations have also been widespread in Sana. Carried out by gunmen on motorcycles, they are aimed at Yemeni security officials, but their motivations are not clear. Some point their finger at Saleh and his supporters, but blaming the former president for everything that is wrong with the transitional process diverts attention from Yemen’s deeper problems. While the delegates in Sana wrangle over the mechanics of Yemen’s future state, the Houthis in the north have dislodged the Salafi stronghold in Dammaj and attacked the heart of the Hashid tribal federation in Amran. In the Hadramawt, tribes have effectively taken over from state security officials after a prominent sheikh was killed by security forces. Tribesmen in the east continue to cut the electrical grid in spite of the Yemeni military’s efforts to stop them. The deliberations and formalities in Sana seem very distant from what is happening on the ground in Yemen. The language of the National Dialogue will certainly shape Yemen’s future state, but whether this state will have any relevance for the lives of ordinary Yemenis is not clear. A much more brutal struggle for physical dominance is taking place outside the halls of the Movenpick Hotel that may have more to do with the future balance of power in Yemen. The Islah Party and Political Islam: Yemen’s Future? The election of the Ennahda Party in Tunisia and the Muslim Brotherhood in Egypt and the unexpected electoral success of the new Salafi parties led many to believe that the Arab Spring was an Islamist Spring. In this view, the secular soft authoritarian regimes of Zine el-Abidine Ben Ali and Hosni Mubarak were stalwarts against the Islamist parties, which appeal to an inherently conservative and frustrated lower class majority in the Middle East. With the stalwarts broken, the idea was that the Islamists would control the future of the Middle East. However, the ouster of Egypt’s Muslim Brotherhood President Mohamed Morsi by the military in July 2013 put the secular authoritarian side back into the political equation. Despite this shift in Islamist politics, in Yemen many consider the Islamist Islah Party the most powerful and the best positioned to do well in an election in the current environment. Indeed, if an Islamist is someone who believes that religion has a role in politics, then in Yemen everyone is an Islamist. The National Dialogue’s subcommittee for the building of the new state surveyed the political landscape of Yemen and found that every political actor—even the socialists and communists—agreed that Yemenis are Arabs and Muslims and that the Shariah is the basis of law. The good governance subcommittee even suggested that high office be restricted to Muslims, a stance that led Human Rights Watch to issue a public bulletin in protest. Yet, while in Yemen all can agree that Yemenis are Muslim and that Shariah is the basis of law, there is little agreement on the nature of Shariah or whether Yemen is state of Muslims or a Muslim state. Furthermore, Islah is not the Muslim Brotherhood of Egypt. It is a coalition party with many different elements and no dominant religious orientation. The roots of Islah lie in an anti-communist coalition that fought socialist insurgents in the middle regions of Yemen in the 1980s. The main components of Islah are the Hashid tribal leadership, merchants and business people with an anti-socialist bent, and various religious groups. The Muslim Brotherhood of Yemen is prominent in Islah’s leadership, and there are those in the party who are more oriented toward Wahhabism, as well as people connected with various branches of Salafism in Yemen. Islah thus represents a political tendency, not a coherent religious doctrine. What is more relevant is Islah’s location in Yemen’s political landscape. Islah is seen as close to Saudi Arabia and anti-Houthi. Islah is the counterweight to Saleh’s General People’s Congress, which tends toward Arab nationalism, though most would hardly attribute a coherent ideology to the GPC either. Islah is pro-Islam, but not any particular Islam, except in terms of the Zaydi Houthis, against which Islah places itself. These are political rather than theological positions. The transitional government has little time to devote to economic issues, yet rising poverty and unemployment are some of the very sources of anger that drove the street protests of 2011. The lack of security hampers any new investments in Yemen and adds costs to those already doing business in Yemen. However, the lack of government is more burdensome than the lack of security. There is no coherent plan to revive the economy. The government has sought investment in the oil and gas sector and in minerals and mining, and is looking for Chinese investment in roads and infrastructure. But investment in big projects will not address the problems of the many unemployed and underemployed or the many young people about to enter the job market. What Yemen needs is an environment in which Yemenis feel safe investing in their futures, and a safe environment can only be created by a functioning government. For this reason, the United States, the UN, and Saudi Arabia would like to see earlier elections that legitimize a government that can begin to take action and develop plans. However, the leaders from the street and those from the smaller political parties in Yemen argue that earlier elections will not give the government legitimacy. On the contrary, elections held in Yemen’s current environment will only lead to a split government between Saleh’s supporters and those former regime supporters in Islah who split with the regime during the Arab Spring. In other words, the same elites will rule in the same manner that led to the crisis in the first place. Yemen’s transitional period is clearly going to take longer than expected, probably another year, but what remains to be seen is whether the new constitution and elections succeed in creating even the semblance of government in the country. As most people in Yemen have little interest in the National Dialogue discussions today, the implementation of the new constitution and the holding of elections may also become little more than a newspaper headline for passersby in the street. “Bin Omar: The Yemeni President Will Continue for Two More Years,” Sky News Arabia, 19 November 2013, http://www.skynewsarabia.com/web/article/482911/. “Bin Omar Denies Suggesting an Extension of the Transitional Period in Yemen,” al-Masdar Online, 2 September 2013, http://almasdaronline.com/article/49607. The “Group of Ten” is comprised of the five permanent members of the Security Council, Saudi Arabia, Oman, Kuwait, the UAE, and a European Union delegation. Abd al-Hakim Hilal, “Bin Omar Presents His Report ‘Unlike His Earlier Reports’ to the Security Council,” al-Masdar Online, 27 November 2013, http://almasdaronline.com/article/52226. The Hirak, or “movement,” is a group of parallel organizations dedicated to promoting southern interests. It began in 2007 with demands of former southern military officers for their reinstatement and quickly widened to represent other demands. “Jamal Bin Omar Speaks about the Details of the Transition in Power,” Mareb Press, 22 January 2014, http://marebpress.net/articles.php?id=23430&lng=arabic. Text of the “Complete National Dialogue,” http://www.ndc.ye/ar-page.aspx?show=114. Text of the “Document of Solutions and Guarantees for the Southern Issue,” http://www.ndc.ye/ndcdoc/Southern_Question.pdf. The General People’s Congress’s members include half the ministers in the transitional government’s cabinet and a majority of members of parliament in addition to, at least formally, Hadi. Hadi and Saleh have been battling for control of the GPC, and Saleh remains dominant. “Yemeni Minister of Legal Affairs: Reveals Law to Return Stolen Money,” Shabwaah Press, 28 January 2014, http://shabwaahpress.net/news/13440/. “The Yemeni Community in America Organizes Protests in Front of Security Council in Conjunction with Bin Omar’s Report,” Sada Aden, 27 January 2014, http://www.sadaaden.com/read-news/104356. World Bank, “Facing the Hard Facts in Yemen,” 26 September 2012, http://www.worldbank.org/en/news/feature/2012/09/26/yemen-talking-points. “The Yemeni Socialist Party Suggests a Preparatory Period of 4-5 Years and Holding Elections in 2014 is Reckless,” Yemen Press, 5 November 2013, http://yemen-press.com/news23831.html. “Al-Qa`ida Takes Responsibility for the Attack on the Hospital of the Defense Ministry and Argues that It Was Attacking an American Joint Operations Center,” al-Masdar Online, 6 December 2013, http://almasdaronline.com/article/5249. “Leadership of the Hadramawt Tribal Confederation Meets in Wadi Nahb and Announces a Number of Resolutions,” Mukalla Star, 10 December 2013, http://mukallastar.com/news/2014/126800.html. Human Rights Watch, “Reject Restrictions on Political Rights,” 24 November 2013, http://www.hrw.org/news/2013/11/23/yemen-reject-restrictions-political-rights.